What is the new SME-instrument? The SME instrument is targeted at all types of innovative SMEs showing a strong ambition to develop, grow and internationalise. It provides staged support covering the whole innovation cycle in three phases complemented by a mentoring and coaching service. Transition from one phase to the next will be seamless provided the SME project proves to be worth further support in a further evaluation. Each phase is open to new entrants. Description: Feasibility study verifying the technological/practical as well as economic viability of an innovation idea/concept with considerable novelty to the industry sector in which it is presented (new products, processes, design, services and technologies or new market applications of existing technologies). 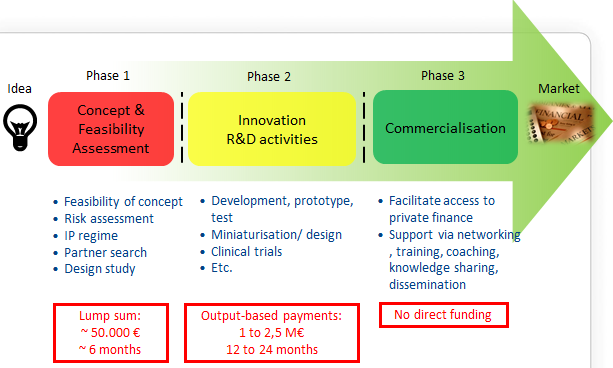 The activities could, for example, comprise risk assessment, market study, user involvement, Intellectual Property management, innovation strategy development, partner search, feasibility of concept and the like to establish a solid high-potential innovation project aligned to the enterprise strategy and with a European dimension. Bottlenecks in the ability to increase profitability of the enterprise through innovation shall be detected and analysed during phase 1 and addressed during phase 2 to increase the return in investment in innovation activities. Funding rate: Funding will be provided in the form of a lump sum of EUR 50,000 (70% funding rate). Description: innovation projects that address a specific challenge and demonstrate high potential in terms of company competitiveness and growth underpinned by a strategic business plan. Activities should focus on innovation activities such as demonstration, testing, prototyping, piloting, scaling-up, miniaturisation, design, market replication and the like aiming to bring an innovation idea (product, process, service etc.) to industrial readiness and maturity for market introduction, but may also include some research. SMEs can subcontract or buy in work and knowledge that is essential for their innovation project in the spirit of the innovation voucher concept. Proposals should be based on a strategic business plan either developed through phase 1 or another means. Funding rate: 70% [or in exceptional cases, where the research component is predominant, the reimbursement rate may be 100%, as specified in each topic]. Support to commercialisation promotes the wider implementation of innovative solutions and customers and supports financing of growth by facilitating access to public and private risk capital. This stage will not provide for direct funding, but SMEs can benefit from indirect support measures and services as well as access to the financial facilities supported under Horizon 2020. Each beneficiary of the SME instrument will be offered business coaching support during Phase 1 (up to 3 coaching days) and Phase 2 (up to 12 coaching days) in addition to the grant offered. This support will be provided through the Enterprise Europe Network (EEN) and delivered by a group of qualified and experienced business coaches. The local EEN office will introduce the beneficiary to the coaching process and propose a selection of coaches from the database managed by the Commission for the beneficiary to choose from. The objective is to accelerate the impact of the support provided through the SME instrument and to equip beneficiaries with the necessary skills, business processes and relevant competencies for long-term growth. Phase 3 does not include individual business coaching, but SME instrument participants will be able to count on continuing EEN support in linking to relevant support services within the Network, regionally or nationally. It is important to note that the objective of coaching is not to support the company in project management or reporting obligations related to Horizon 2020 participation.